Telomeres are short, multi-repeat non-transcribed sequences (TTAGGG) and some binding proteins that make up a special structure. In addition to providing a buffer for non-transcribed DNA, protects chromosome ends from fusion and degradation, chromosomal localization, replication, it plays an important role in protecting and controlling cell growth and lifespan, and is closely related to apoptosis, cell transformation and immortalization. The sequence constituting of telomere is about 50 to 200 nucleotides. Because of the inability to achieve complete replication in multiple cell divisions, the cell terminates its function and no longer divides. 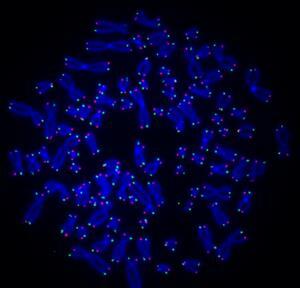 Therefore, severely shortened telomeres are signals of cellular aging. In some cells that require an infinite replication cycle, the length of the telomere is retained by a specific DNA polymerase which is capable of synthesizing telomeres after each cell division. Studies have found that telomere DNA is composed of simple DNA highly repetitive sequences that can be used to add tail of telomere DNA to prevent apoptosis due to shortening of telomeres. Telomeres are located at the end of the chromosome, and their function is mainly to ensure the stability and integrity of the genome. Studies have found that telomeres at the ends of chromosomes not only protect chromosomes from nuclease degradation, but also prevent chromosomes from merging. In addition, telomeres can compensate for vacancies caused by elimination of RNA primers at the 5′ end of the lag chain during DNA replication. Interestingly, telomeres are a special site for gene regulation, often inhibiting the transcriptional activity of genes located near telomeres. Telomere is a substance that found at the top of a chromosome when scientists are looking for genes that cause cell death. Telomere itself does not have any coded function, it is like a high hat placed on the chromosome head. In new cells, once the cells divide, the telomeres at the top of the chromosome are shortened once, and when the telomeres can no longer be shortened, the cells cannot continue to divide. At this time, the cells reached the limit of 100 times of general division and began to die. Therefore, telomeres are regarded by scientists as “life clocks.” However, in some cells, such as sperm, cancer cells, the telomeres are not shortened with replication. Further studies have found that there is an enzyme in these cells that maintains the telomere length. It maintains the telomere length unchanged during cell replication. Telomere replication is catalyzed by a specific reverse transcriptase, telomerase. Telomerase is not detected in normal human cells. In some benign diseased cells, telomerase activity was also not detected in fibroblasts cultured in vitro. However, this enzyme is positive in germ cells, testis, ovary, placenta and fetal cells. A remarkable finding is that malignant tumor cells have highly active telomerase, and telomerase-positive tumors include lymphoma, acute leukemia, breast cancer, colon cancer, lung cancer and the like. In addition, due to the nature of telomere, the relationship between telomere and body aging is also a research hotspot in the scientific field. Researchers not only hope to find all the life clocks in the human body, but also hope to find a way to slow down the clock, and to achieve the expectation of extending life. « What is Dengue fever?